THE WHY: Youth and young man/womanhood can be perilously tricky things but for two full-length albums (Language & Perspective and Disappear Here) Bad Suns have always managed to make the common angst of those conditions sound and feel as balmy as a top-down cruise up the Pacific Coast Highway. It’s an indie pop/rock niche of note that they have tapped – prevalent and relevant and relatable to the touch. It’s also a formula that has yet to fail the Los Angeles quartet. So, any fans who had stylistic concerns over Bad Suns hooking up with Epitaph Records, feel free to exhale: the boys are fine. After more than a few heart-on-sleeve miles by song, Mystic Truth is a bright and healthy exhalation of their own. All of the familiars are there: the lyrical self-awareness, Christo Bowman’s strident vocals, the can’t-help-but-write-a-crushing-hook, the melody infection, and the solid song structures. But while the punch and piano of album opener “Away We Go” and “One Magic Moment” properly set the table with the band’s penchant for buoyancy and making the girls dance, it’s also semi-deceptive because Mystic Truth divides itself into a Side A/Side B situation (which is always refreshing) as the songs shift, not only in tempo but also in the direction of thought. “Separate Seas” and “Starjumper” uniquely take the listener’s emotional temperature as does the subtle Beatles-esque vitality and optimism of “Darkness Arrives (And Departs).” I did not see the weight of that song coming and that’s never a bad thing. Even though “Howling At The Sun” could have easily held a place on Disappear Here, its idealized love is more fitting with the hopeful notes of growth that Mystic Truth hits. 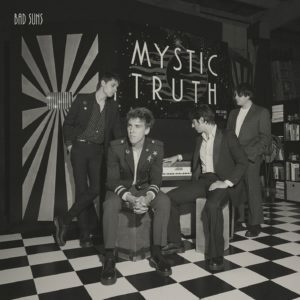 So while the album is as earnest, summery, and plucking at young hearts as ever, Mystic Truth captures Bad Suns’ progression past the angst and towards the calm. And is it just me or does this album feel looser? You know, as in the way one might feel after they exhale? Perhaps it’s just me. Either way, that looseness serves Bad Suns well which is why Mystic Truth is our Album Of The Week.